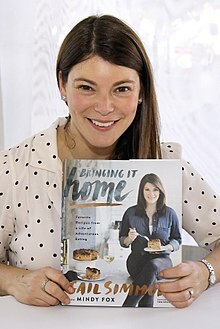 Gail Simmons (born May 19, 1976) is a Canadian food writer and cookbook author. Since the show’s inception in 2006, she has served as a permanent judge on BRAVO’s Emmy-winning series Top Chef. Simmons was previously the head critic on Top Chef Duels and host of Top Chef: Just Desserts, Bravo’s pastry-focused spin-off of the Top Chef franchise. She was also co-host of "The Feed," which aired in 2014 on FYI, A+E’s new lifestyle network. In addition to her work on Top Chef, Gail makes frequent television appearances on NBC’s Today and ABC’s Good Morning America, among others. She has been featured in such publications as New York magazine, Travel + Leisure, GQ, People, Los Angeles Times, and more. She offers advice for anyone who's new to the food world and wants to break into the culinary limelight: you should "love what you’re doing and you’ll manage to do it - no matter how hard it is". Simmons was born in Toronto, Ontario, Canada, to a Jewish family (of Eastern European origin). and graduated from McGill University in Montreal, where she majored in anthropology and Spanish. She is the youngest of three siblings in a Jewish family, which includes her mother Renee, formerly a food columnist for Globe and Mail who conducted cooking classes in their home, and her father, Ivor. She began her food-journalism career writing restaurant reviews for the McGill Tribune before becoming an intern at monthly magazine Toronto Life and later wrote for the daily National Post newspaper. Simmons attended the Peter Kump New York Cooking School in New York City and apprenticed at Le Cirque and Vong. Simmons worked for food critic Jeffrey Steingarten as his assistant for two years at Vogue before becoming the special events manager for chef Daniel Boulud's restaurant empire for three years. In 2004, she joined Food & Wine as special projects manager. Simmons has been a judge with Top Chef since its March 8, 2006 season one premiere; she also hosted the spinoff show, Top Chef: Just Desserts, which premiered on September 15, 2010, after the seventh-season finale of Top Chef. She teaches viewers new ways to cook with familiar and unusual staples, in their kitchens, in the KitchenDaily.com online video series titled The Pantry Project. Her Bravo.com bio reports: "Gail makes frequent television appearances on The Today Show, Good Morning America, Fox & Friends, among others." She has made appearances at prominent culinary festivals; examples in the U.S. include the South Beach Wine & Food Festival, New York City Wine & Food Festival, Pebble Beach Food & Wine, Kohler Food & Wine Experience and the Cayman Cookout. Gail is an active supporter of Common Threads, an organization that teaches low-income children to cook wholesome, affordable meals. She was a founding member of Food & Wine’s Grow for Good Campaign to raise funds and awareness for sustainable agriculture programs in the United States. She sits on the boards of the American Institute of Wine & Food, Hot Bread Kitchen, the Institute of Culinary Education’s Alumni Committee, the Women at NBCU Advisory Board, and the food rescue organization City Harvest. She was selected for the 2010 Forward 50 by The Jewish Daily Forward. Simmons married Jeremy Abrams in 2008. Their wedding featured a farmers' market theme, and appeared in Martha Stewart's Real Weddings magazine. Simmons wore a Carolina Herrera wedding gown and her mother's veil from 42 years earlier. She said in 2012 she "put a big chunk of savings into his business", Audiostiles which creates background music programming for the hospitality industry. She gave birth to their daughter Dahlia Rae on 29 December 2013. Simmons gave birth to their second child, a son named Kole Jack, on May 23, 2018 . 2007 At the Table with... Herself Episodes: "Rob Feenie" and "Daniel Boulud"
2010 Avec Eric Herself Episodes: "Catch and Cook" and "Cayman Cookout"
2011 Through the Grapevine Herself Episode: "Checking Out Chiantis from Tuscany"
Season 1 episode 12: "Chef McEwan's Favourite Things"
2013 Royal Pains Herself Season 5 episode 6: "Can of Worms"
Season 3 episode 5: "Savory Snacks"
2015-2016 Guilty Pleasures Herself Season 2 episodes 5 and 10: "Holy Moly Burgers" and "Coast to Coast Indulgences"
Season 12 episode 6: "Open Grill Season"
Season 4 episode 12 and season 5 episode 5: "Taco Tug-O-War" and "The Whole Enchilada"
Simmons, Gail (2011). Talking with My Mouth Full: My Life as a Professional Eater. Hyperion. ISBN 1401324509. Simmons, Gail (2017). Bringing It Home: Favorite Recipes from a Life of Adventurous Eating. Grand Central Life & Style. ISBN 1455542202. ^ a b "Gail Simmons - Chef, Television Personality - Biography.com". Biography.com. A&E Networks. Retrieved December 14, 2015. ^ "Gail Simmons:'Working - and talking - with my mouth full'". finedininglovers.com. 2012-10-16. Retrieved 2012-10-16. ^ a b c d "Gail Simmons". People.com. Retrieved 14 November 2012. ^ a b "Confessions of a picky eater : McGill News". Publications.mcgill.ca. Retrieved 2012-10-20. ^ a b c d e Gernstetter, Blake (November 17, 2010). "So What Do You Do, Gail Simmons, Host of Top Chef: Just Desserts?". Mediabistro. Retrieved October 18, 2014. ^ "One On One With Gail Simmons - Part 1". Yumsugar.com. 2007-08-30. Retrieved 2010-09-21. ^ "One On One With Gail Simmons - Part 2". Yumsugar.com. 2007-09-07. Retrieved 2010-09-21. ^ a b c d e f "Bio: Gail Simmons". Bravo.com. Retrieved 14 November 2012. ^ "Forward 50 –". Forward.com. Retrieved 2012-10-20. ^ Fusaro, Kim (February 22, 2012). "A Proposal Story: This Glamourous [sic] Girl Got a Low-Key Proposal—And Loved It! (Plus, the Book You Must Put On the Top of Your Reading List!)". Glamour. ^ Karol, Gabrielle (August 29, 2012). "10 Things You Don't Know About My Finances: Gail Simmons". Learnvest.com. Wikimedia Commons has media related to Gail Simmons.